Portada > Module products > Institutional Division > Dishwashers > OXA-DUROMAX ENZ. OXA - DUROMAX ENZ. is specially designed for washing glassware, cutlery and crockery in automatic dishwashing machines and tunnels. It is also used successfully in the washing of pots and aluminum caps, avoiding blackening. It is effective against grease, starches, sauces, tannins etc. and rinses off easily, maintaining the glass in good condition for a long time. It does not attack the glass, aluminum, prints, metallic enamel etc. Its low foam allows use in any industrial dishwasher. 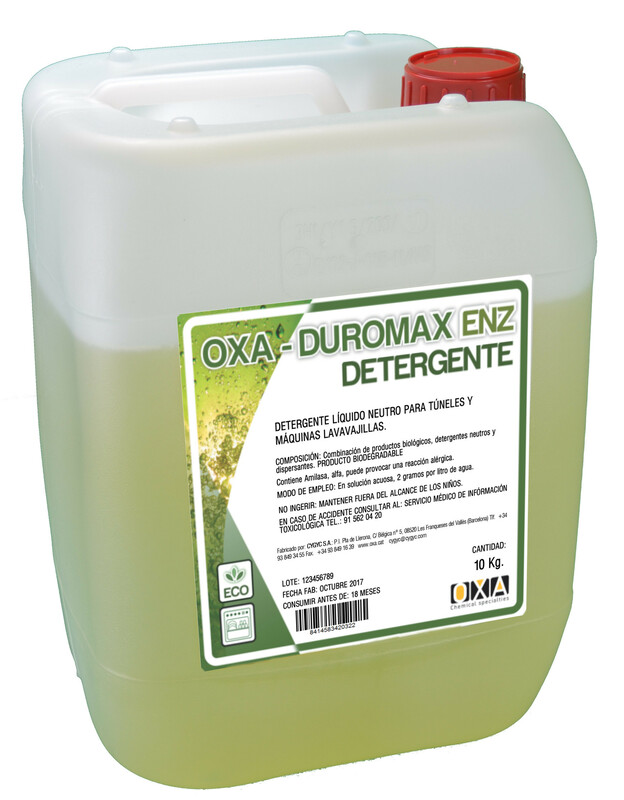 OXA - DuroMax ENZ is a non-caustic product, preventing work accidents. Alkaline liquid detergent for automatic dishwashing. Anti-drop polisher for low-foam dishwasher.